Mining Services - Sumac Geomatics Inc.
By their nature, new claims are usually located in isolated, inaccessible and remote areas. Maps will often not already exist for new exploration sites, but are required to plan expensive drilling, trenching or sampling activities. Claims areas may be small, and be in extreme topography such as mountainous terrain. Manned aerial surveys still provide many advantages to prospectors and developers at the exploration of a property’s lifecycle. Sumac works with its partners to collect manned aerial survey data over larger project sites. It may not be possible to schedule a manned aerial survey flight in a timely-fashion. Sometimes when specialist sensors are required, it may not be possible to collect all the data required in one mission. With lower logistical overhead, working with Sumac provides the additional flexibility to collect a suite of data products using mapping sensors mounted on UAVs; which provides the opportunity to assemble a range of site-wide reference datasets across the property, regardless of the terrain or project requirements. Working in these remote areas brings risk for any type of ground survey. Regardless of whether a manned or unmanned platform is used to collect the raw data, Sumac applies a range of property-wide digital terrain modelling techniques. Not only does this provide contour mapping, but specific sets of analyses can be performed, such as to more efficiently place drill pad locations. After investing in innovative new magnetometer sensors, geophysical and topographic mapping data can be fused to better classify outcrops, and assemble an increased depth of intelligence about the property. The result is better risk mitigation and efficient application of prospecting funds to the locations that really need the investment. Issues related to the remote nature of development properties can also lead to maps and surveys of sufficient currency of detail to be available for the permitting, planning and construction phases of a mine development. Prior to breaking ground, obtaining environmental permits is a necessity. 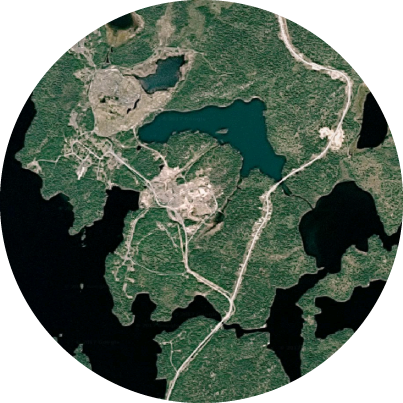 In addition to simply delivering orthophoto products; at Sumac we are unique in the expertise that we offer in forestry and land classification. Due to the extensive experience that we have on Provincial-level forestry mapping projects, the team at Sumac have the professional qualifications to deliver classified maps (vegetation types, habits, even tree counts) to support the requirements of the permitting process. These can be delivered in a range of formats such as digital GIS or CAD, or paper plots, as needed. Planning requires more information than simply contours or a digital terrain model too. Access to site and logistics need to be planned for. Where are the roads; where are the rivers? Where could powerlines be laid; what roads or rivers need to be crossed? When it comes to construction; there is even more of a reason for topographic mapping to be produced at a scale that is suitable for engineering work. Sumac’s team of geospatial professionals have the expertise, tools and experience to produce these products. Successful mining operations require constant monitoring of their production procedures. Blasting, crushing and excavation operations are not exact sciences. Measurement of outputs of outputs of both ore and waste are needed to trace likely inefficiencies or leakage in production procedures. Non-contact data collection techniques such as laser scanning or drone photography have for some time been favorable techniques for measuring stockpiles or pits as they collect data far quicker, and minimize the health and safety risk of sending surveyors to walk on the piles with a GPS rover or similar. Monitoring stockpiles to produce reliable data for enterprise mine management systems, requires more than simply calculating a volume from data collected by a drone. The technique used for calculating surface areas of the pile, especially if automated processes, can in themselves introduce misreporting errors. To produce reliable data, the team needs to understand the implications of the measurement processes used. At Sumac, we have a track-record in stock pile monitoring; our team has the experience to identify fluctuations in data over time that have helped our clients identify leakages in their procedures and save significant production costs. We are depended upon to undertake drone-based inspection on fixed monthly schedules and provide data for management meetings within 24 hours of our UAV crews collecting the data. During the closure, decommissioning and rehabilitation phases of a mine development, literally a complete picture of how the landscape has been returned to its pre-development state is required. A picture that can be understood by everybody is the orthophoto. Sumac’s remote sensing analysts have the tools and expertise to not only produce othophotos, but also undertake land classification mapping and report on landscape change, identifying any discrepancies in the landscape of the property relative to before mining took place.